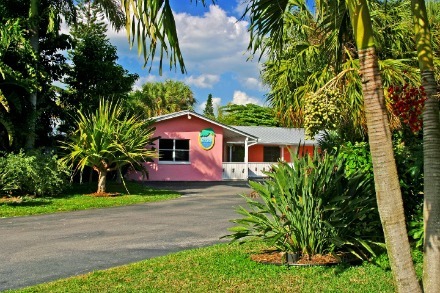 Small inns, motels and hotels are often the most rewarding and economical way to enjoy the delights that Florida has to offer. Quite often you will feel like a member of the family because many of these places are family owned. Being locals themselves, the owners of these small places know the best restaurants, attractions and shopping to help make your vacation or even a brief stay a success. Since they own the place and often live there, they also make sure that maintenance is not overlooked and that the place is clean. Many of us are afraid to stay in a place that is unknown to us. With big chains we have come to expect a certain level of comfort and cleanliness. This is not always the case with the smaller privately owned places. TripAdvisor is one of the sources that can be used to check these places out, but it's not foolproof. One or two bad reviews can scare you away and glowing reviews from the owners and their friends can make the place look better than it is. 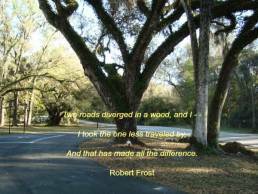 The places you will learn about on the Florida Backroads Travel website have been vetted either by me, my friends or a trusted organization and will not disappoint you. Vero Beach is an upscale community that straddles the Intracoastal Waterway and has neighborhoods on both the mainland and beach sides. Caribbean Court is on the barrier island that divides the ocean from the waterway. The inn is just a few hundred feet from the ocean. The beaches are magnificent and uncrowded in this part of Florida and this is in a quiet neighborhood. The Caribbean Court has 18 guest rooms decorated with original art and antiques and the entire inn is decorated with hand painted tiles. All rooms are furnished with either a King Size, Queen Size or two full size beds. The inn is affiliated with Maison Martinique across the street, a fine dining restaurant with a complete menu of French cuisine. Havana Nights Piano Bar is on the second floor of Maison Martinique and is a popular nightspot for sophisticated locals. 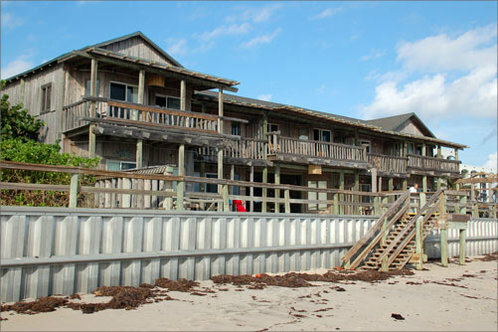 The first two buildings of the historic Driftwood Inn and Restaurant were completed in 1937. Waldo Sexton was the eccentric genius who created this masterpiece from weathered wood he found on the beach. Sexton was an early pioneer in the development of Vero Beach. The buildings, directly on the Atlantic Ocean, were originally Waldo's home. Shortly after the Sexton's moved in, they began renting rooms and cooking meals for their guests. Today's operation has grown from that first venture. The resort has been expanded several times over the years, and the new buildings preserve the original beach comber theme that gives the place such charm. The Driftwood Resort has an assortment of guest rooms for nightly stays along with apartments for longer visits. There is a large swimming pool in the center of the complex convenient to all rooms and to Waldo's Restaurant. You can dine inside or outside by the pool and enjoy the ocean view. This resort is a people watching experience. You will see many families and children having a great time. In 1979 all of the apartments and rooms were converted to interval ownership, and the resort is now operated by a management company. In 1994, The Driftwood Inn and Waldo's Restaurant were added to the U.S. National Register of Historic Places. This historic hotel has been in business since 1883. It is on the east shore of Lake Dora in the heart of downtown Mount Dora with all of its shops, restaurants and other attractions. It is a favorite spot to watch sunsets for locals and tourists alike. Owners Jim and Alexandra Gunderson have been steadily renovating rooms and are dedicated to preserving this oldest continuously operating example of all Florida historic hotels. 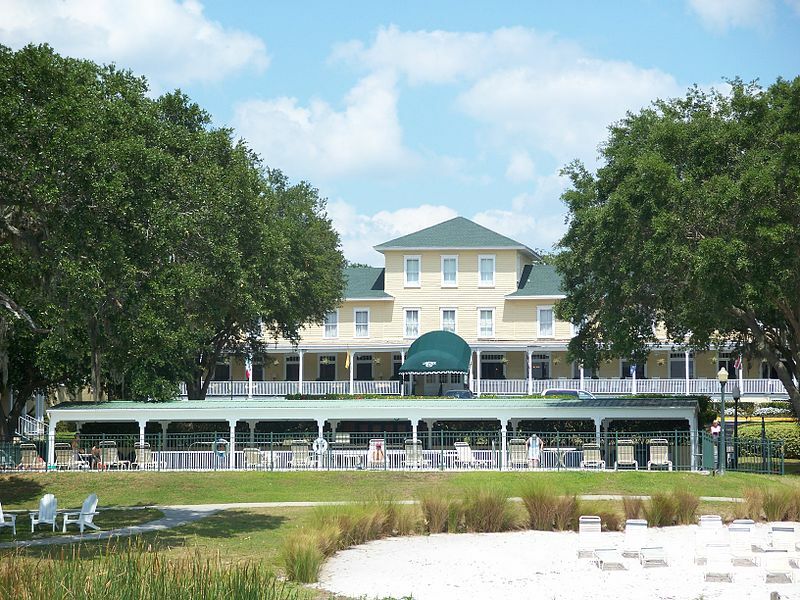 The Inn boasts Tremainʹs Lounge (with a fireplace and music), a large dining room, a swimming pool overlooking Lake Dora and a dock for taking captained boat tours and seaplane flights. Read more about Lakeside Inn. This totally renovated bed and breakfast inn includes several rooms along with secluded cottages. It is in the heart of downtown Gainesville and close to many shops and restaurants and is a brief hop to the University of Florida. 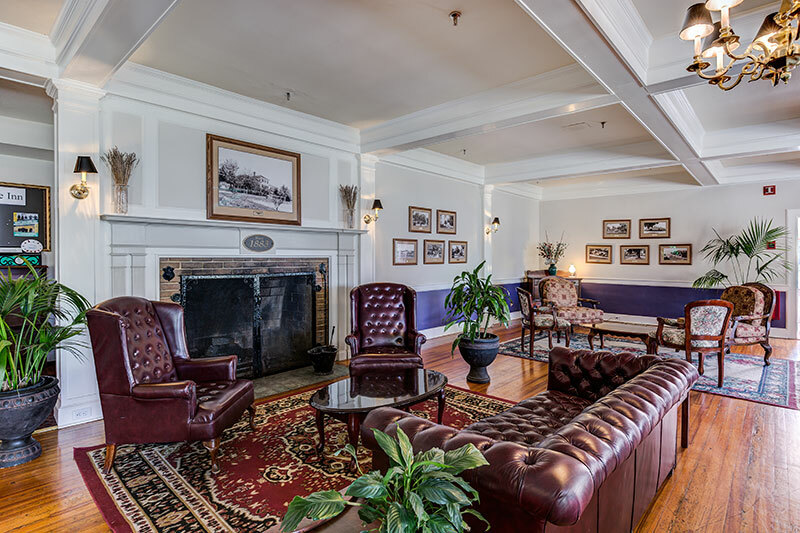 Joe and Cindy Montalto purchased what was then known as the Baird Mansion and transformed the 1885 French Second Empire Victorian structure into the completely restored inn you will enjoy today. 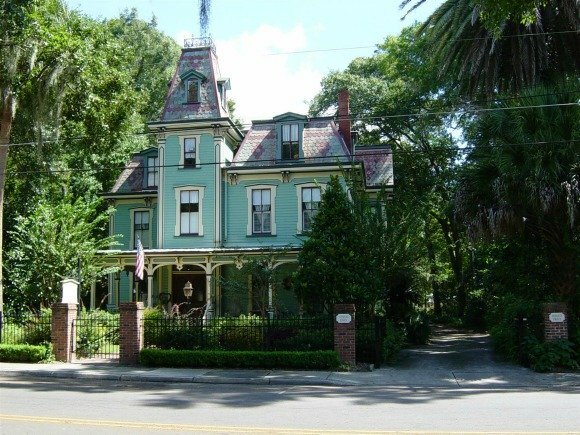 The inn has received many honors including "Most Romantic Bed and Breakfast in Florida" by Most Romantic Escapes; "Best Bed and Breakfast in Florida" by Florida Living Magazine. The inn has also been featured in Southern Living Magazine. You should know that the inn is usually booked solid for University of Florida football game weekends. Joe and Cindy are big Gator fans! Jensen Beach is a small community on the west bank of the Indian River Lagoon that separates Hutchinson Island, a barrier island, from the Atlantic Ocean. This is salt water country, and a great location for one of the most unusual Florida fish camps. Even though River Palm Cottages & Fish Camp is a fish camp, only about 15 per cent of their guests are fishermen. 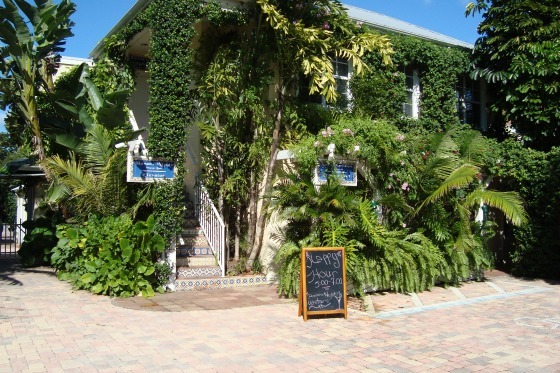 More than twenty Key West style guest quarters are scattered among 7.2 acres of lush tropical plants. The cottages are extremely quiet. This inn is an all suites motel. Each suite opens into a sitting area with couch. All units have a private bathroom, and a shared terrace facing the swimming pool and the Steinhatchee River. Each suite has a flat screen television. Although the inn is an older place, it is super clean and well maintained. They welcome dogs under 35 pounds. 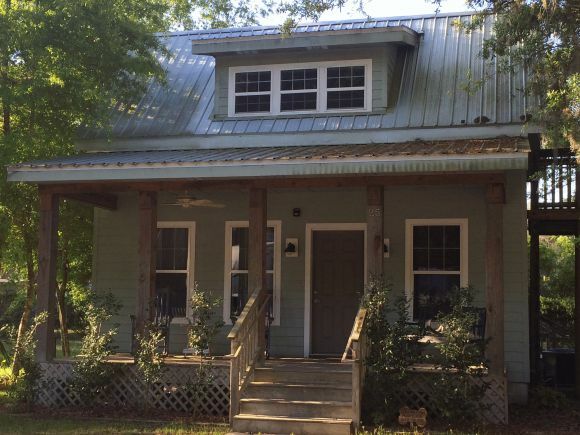 Steinhatchee is a quaint village surrounded by nature preserves and is near a scenic waterfall on the river. It is a very popular little place during scalloping season (June - September) and is a popular "off the beaten path" destination all year round. The Steinhatchee River flows past the inn to the nearby Gulf of Mexico. It is truly a place where you can experience "Old Florida". There are several authentic hometown restaurants in Steinhatchee, many of them within a short walk of the Steinhatchee River Inn. These restaurants include Fiddlers, Roy's, Kathy's Crabs and Bridge End Cafe. Needless to say, fresh seafood is easy to find in this authentic fishing village. 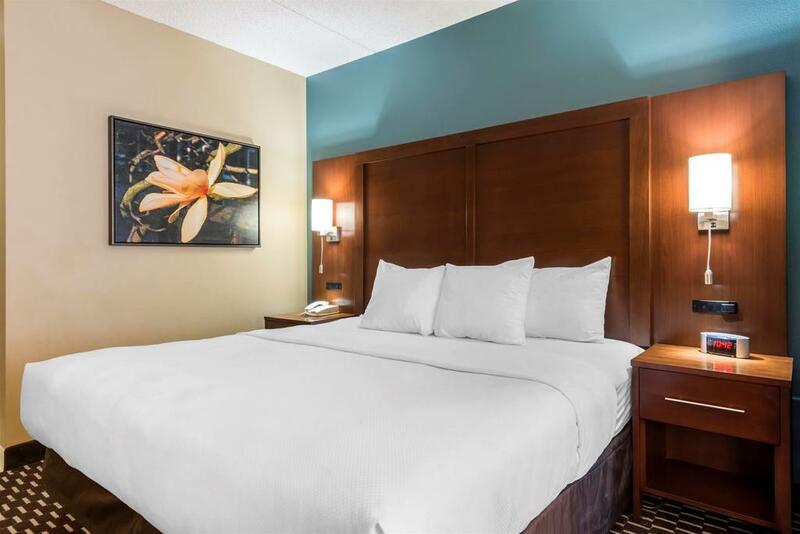 Your suite is furnished with a microwave, mini fridge, coffee maker, cable television, and limited WiFi. Suites with kitchenettes also have a full size refrigerator and freezer, a stove with oven, pots, pans, skillets, plates, cups, utensils and everything you need including a kitchen sink. The suites with a kitchenette are attractive to guests that would rather grill outside or eat at home. 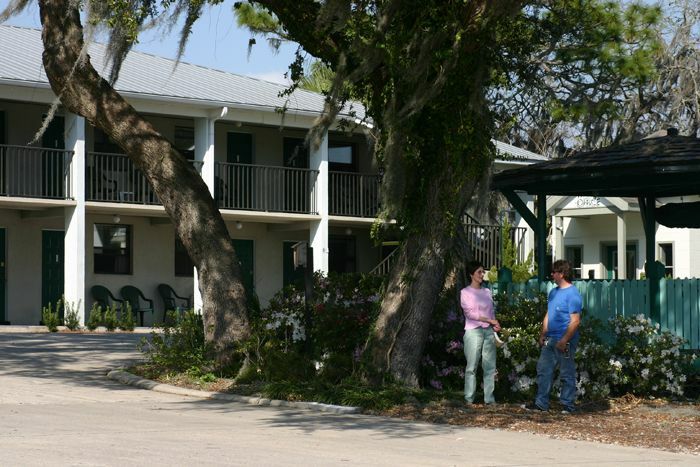 The Steinhatchee River Inn is a great base from which to explore Steinhatchee and the surrounding area. 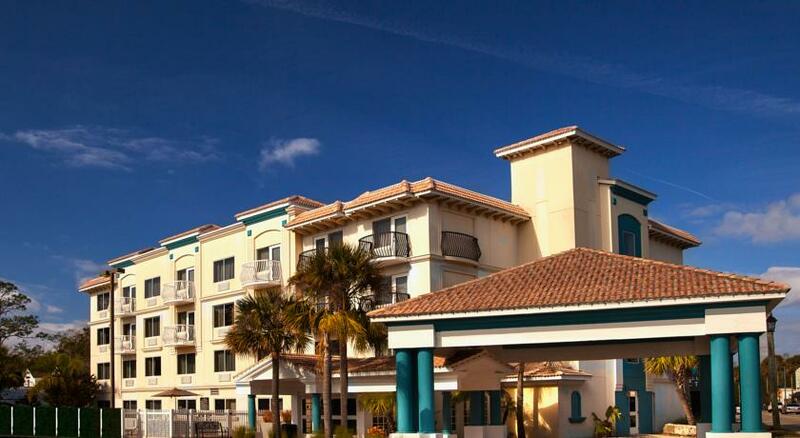 Villa Victor Hotel is in historic downtown St. Augustine within walking distance of the major attractions as well as a host of great restaurants. The historic Castillo de San Marcos is nearby along with many other historic sites and buildings. Visitors to St. Augustine know how difficult it can be to find a parking space. Villa Victor Hotel has its own parking facility that will save you a lot of time and worry. The hotel includes a variety of rooms including King and Queen Suites with balconies, and some suites with whirlpool tubs. All rooms are spacious and modern, and include upscale bathroom amenities, dining on the property, and outdoor pool, and a spa. Free WiFi is also available on the entire hotel property. All rooms are smoke free and feature refrigerators, coffee makers, irons, and ironing boards. The Chiku Cafe' & Bar is in the hotel and offers delicious breakfast choices, smoothies, juice, oatmeal, scones, and even a breakfast burrito. Lunch and dinner features bar bites, salads, cheese plates and other light meals you can take up to your room and enjoy. To top it all off, the hotel offers locally roasted coffee from the Kookaburra Coffee Company, and also features local craft beer in addition to a house-made sangria. You can also have a cocktail before heading up to your room. Webster is a small central Florida town famous for its flea markets., open only on Mondays, and one of the largest in the United States. Many people like to come to Webster Country Cottages on Sunday night to go to the flea markets on Monday. 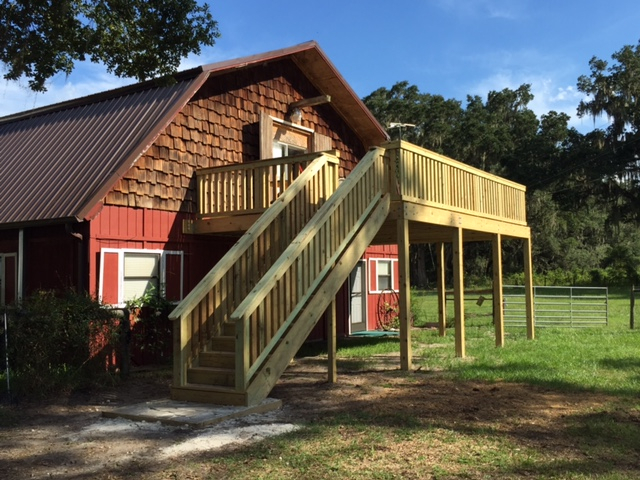 The gated property is on a small and peaceful ranch in the Florida wilderness. The inn features 3 cottages and has all of the modern conveniences. The largest cottage has 3 bedrooms and 2 baths, the middle sized one has two queen beds and a sleeper sofa with a full bath, and the smallest is an efficiency with a great view and large deck. The cottages are on the grounds of a small ranch and enjoy a diverse following of business people, snowbirds, and flea market enthusiasts. As fish camps go, this fish camp, lodge and RV park is a Ritz Carlton. If I could have, to hold forever, one brief place and time of beauty, I think I might choose the night on that high lonely bank above the St. Johns river. Welaka is about 40 miles southwest of St Augustine, and about the same distance northwest of Daytona Beach. It is close enough for comfortable day trips, but far enough away from the maddening crowds. This resort caters to fishing enthusiasts and their families, and it is on a magnificent stretch of the majestic St Johns River in the village of Welaka. The resort boasts a swimming pool and a variety of cottages of varying sizes perfect for a couples getaway or a larger family. Most of the cottages are fully equipped with kitchens and are set up so you can live there for long periods of time. You may just want to do that once youʹve tried this place with its great views of the largest river in Florida. This secluded camp is on the north shore of Lake Talquin, a large lake managed by the State of Florida and known for its fine fishing. Speckled perch and bass are favorite catches in this lake. 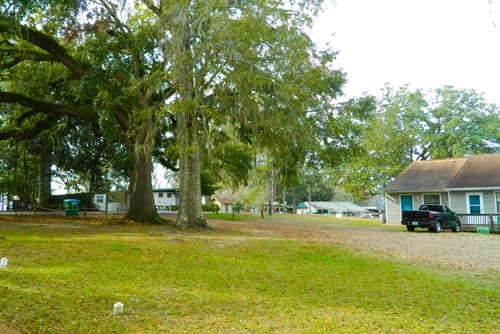 Whipporwill is at the end of a secluded road, and even though you will only be 30 minutes by car west of Tallahassee, you will feel like you are in Old Florida. Most of the shoreline of the lake is in a natural forest setting. The lodge has several modern cottages and cabins along with some RV sites. The Whip Waterfront Pub and Grub bar and grill is on the property so you donʹt even have to leave if you donʹt want to. Nearby Lake Talquin State Forest has a lot of things to do if you donʹt feel like fishing: hiking, horseback riding, cycling and lots of nature trails.